German composer, keyboard player, and writer on music; second son of J. S. and Maria Barbara Bach. His childhood was spent in Cöthen and Leipzig, where his father was his principal teacher. At Leipzig he attended the Thomasschule, and in 1731 he matriculated in law at the University of Leipzig. He switched to the law program at the University of Frankfurt an der Oder in 1734. In 1738 he received a summons from Frederick , then Crown Prince of Prussia, to serve as chamber musician at his court in Rheinsberg. After Frederick's accession to the throne in 1740, when the court moved to Berlin, Bach had frequent contact with J. J. Quantz , Carl Heinrich Graun and his brother Johann Gottlieb Graun , Franz Benda and his brother Georg Benda , and literary figures such as Ramler and Lessing. 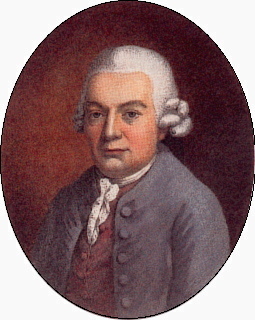 Bach published several path-breaking sets of keyboard works during this period, including the Prussian Sonatas Wq. 48 (1743), the Württemberg Sonatas Wq. 49 (1744), and later the Sonatas with Varied Reprises Wq. 50 (1760). Frederick, however, showed little enthusiasm for his music. Bach was severely underpaid at court, and at the end of the Seven Years' War (1763) he began to seek employment elsewhere; in 1767 he was appointed Telemann 's replacement in Hamburg. There he assumed posts as music director at five churches and as Kantor at the Johanneum; he remained in the city for the rest of his life. Nearly all of his sacred vocal music dates from these years, including the oratorios Die Israeliten in der Wüste ( 1769), Die letzten Leiden des Erlösers (1770), and Die Auferstehung und Himmelfahrt Jesu (1777-80). Also from this period are the ten symphonies Wq. 182-83 and the six sonatas, rondos, and fantasies "für Kenner und Liebhaber" Wq. 55-59, 61. Eugene Helm's thematic catalog includes nearly 900 works; central to the oeuvre is the keyboard. More than 350 works are for solo keyboard: sonatas, fantasies, rondos, variations, fugues. Also included are nearly 100 concertos or sonatinas, about fifty chamber works with obbligato keyboard, 70 trio sonatas, twenty symphonies, about 100 solo songs, and more than 100 choral works. Bach was author of the single most important treatise of the era, Versuch über die wahre Art das Clavier zu spielen, 2 vols. (Berlin, 1753-62).